African American Heritage Pictures, Puzzles, and Word Games by Glenda Jenkins Simmons is a combination textbook, workbook, and puzzle book. This book is versatile, and the information is timeless. It is appropriate for the classroom, for after-school programs, or for the waiting room in your dentist’s office. 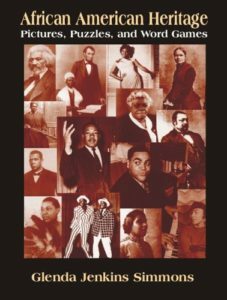 For individuals twelve years and older, this book offers a wealth of knowledge on subjects of African American heritage. What African American was a famous Shakespearean actor of the 1800s? Who was the African American bicycle champion of the late 1800s? What African American was the first person to reach the North Pole? Who were Vernon Dahmer and Fannie Lou Hamer? If you are looking for a captivating and different approach to learning black history, you will find it in African American Heritage Pictures, Puzzles, and Word Games.